GATE COAP 2019 will be conducted by Indian Institute of Technology Madras (IITM). 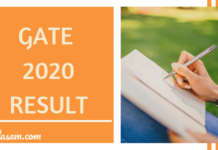 The registration for COAP 2019 started from March 20 2019, onwards. The aspirants can register for the Common Offer Acceptance Portal (COAP) online at coap.iitm.ac.in. COAP is the common platform for the registered candidates to make the most preferred choice for admission into an M.Tech. Programme in the various participating institutes. Candidates who have qualified GATE 2019/ 2018/ 2017 can participate in GATE COAP 2019. Through COAP, a candidate can apply to the respective Institute(s) for M.Tech. admission. After which the participating institutes publish an admission offer. Check more details on COAP 2019 from this page. There are 20 IITs, 01 IISc which are the participating institutes for COAP 2019. Furthermore, a PSU namely, NPCIL is one of the participating PSUs in COAP 2019. The candidates can check the complete schedule for GATE COAP 2019 from the table below. COAP is the Common Offer Acceptance Portal in which all the participating institutes upload their M.Tech. admission offers at once place and then the registered candidates will select any one of the available offers. 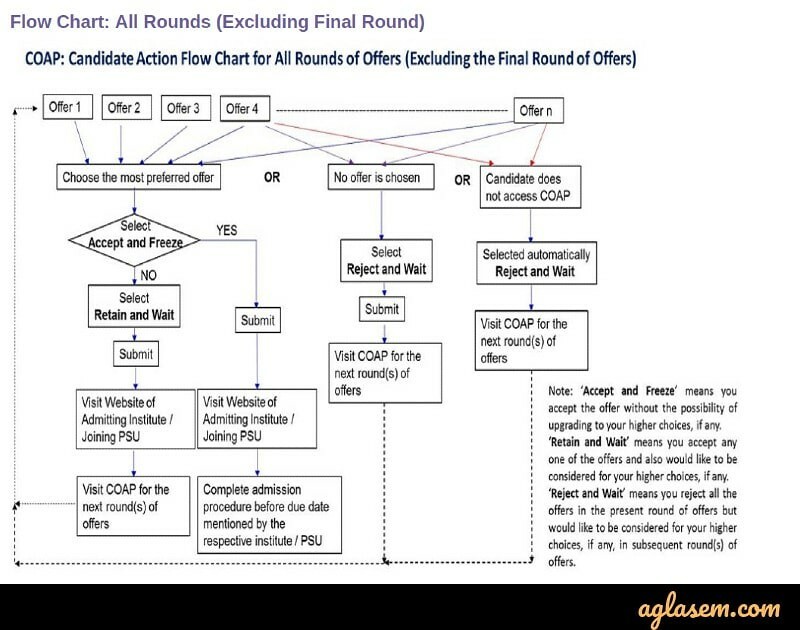 The candidate can select maximum one offer out of available offers in each round. The candidates who accept the offer of the participating institutes will then have to complete the admission procedure before the due schedule. Candidate can also visit COAP for next round(s) of admission. The candidates can check the complete list of IITs and IISc which are participating in COAP 2019 from below. Candidates who have qualified the Graduate Aptitude Test in Engineering (GATE) in the year 2019/ 2018/ 2017 are eligible to register for COAP 2019. The registration for COAP 2019 can be done online at the official website. To register online, the candidates need to fill in details such as their name, GATE Registration number, GATE score(s), etc. Submit the registration details after which the candidates will receive the Login details on their registered email id and mobile number. After successful completion of registration at COAP, a candidate will be then able to access information on offers made by the participating Institutes. The candidates should select this option only when they are confident and willing to accept one of the present offers. Furthermore, this option should be opted by candidates only if they are confident that they do not want to upgrade to higher preferences, if any, in the subsequent round(s) of admission. Hence, the candidates who will opt this option will not be considered in the subsequent round(s) of admission in any of the participating academic Institutes and PSUs. Once the candidates have selected the ‘Accept and Freeze’ option, they should confirm the submission of the decision by clicking on the “Submit” button. After submitting the decision, the candidate should visit the respective Participating Institute’s Admission Portal or PSU’s Job Portal and follow the procedure as per the instructions on the respective website. The candidates should select this option if they are accepting one of the present offers and also would like to be considered for upgrading to the candidate’s higher preferences, if any, in the subsequent round(s) of offers. Note that those who select this option will not be considered for the other rejected offers in the current round. However, they will be considered for other higher preferences, if any, in the subsequent round(s) of admission. After selecting the “Retain and Wait” option, the candidate need to click on the “Submit” button to confirm the submission of their decision. Next, the candidates should visit the resp[ective participating institute admission portal or PSUs job portal and then follow the procedure as provided on their respective website. The candidates should select this option if they are not willing to accept any one of the offer(s). Nevertheless, such candidates will still be considered for other higher preferences, if any, in the subsequent round(s) of admission offered in any participating academic Institutes and PSUs. What After the Acceptance of Admission Offer at COAP 2019? Amongst the n number of offers, if a candidate chooses the most preferred offer, then next he/she has to decide whether they want to “Accept & Freeze” or “Retain and Wait” or “Reject and Quit”. If a candidate has accepted the admission offer, the next step is that they have to visit the official website of the Admitting Institute/ Joining PSU. Then next the candidates need to complete the admission / joining procedure within the due date.